(Nanowerk News) Researchers have overcome a major obstacle in efforts to use tiny structures called carbon nanotubes to create a new class of electronics that would be faster and smaller than conventional silicon-based transistors. Carbon nanotubes, which were discovered in the early 1990s, could make possible more powerful, compact and energy-efficient computers, as well as ultra-thin "nanowires" for electronic circuits. The nanotubes might be ideal for future electronics because they conduct electricity more efficiently than any other metal, but their practical application requires that they be manufactured to specific standards. Now scientists in the Materials Science Division at the Honda Research Institute USA Inc., Purdue University and the University of Louisville have learned how to control the formation of carbon nanotubes so that they have either metallic or semiconducting properties. "This problem of how to control whether you have a metal or a semiconductor is the key stumbling block in making transistors out of carbon nanotubes," said Eric Stach, an associate professor of materials engineering at Purdue. "Solid-state electronics is built around the fact that you can control the semiconducting properties of silicon." Findings will be detailed in a research paper appearing Friday (Oct. 2) in the journal Science. The research is led by Avetik Harutyunyan, principal scientist at the Honda Research Institute USA Inc. in Columbus, Ohio. "This is the first report that shows we can control pretty systematically whether carbon nanotubes are metallic or semiconducting," Harutyunyan said. "We have a 91 percent success rate of producing metallic nanotubes." Silicon-based transistors control the flow of electrons by using specific combinations of metals and semiconductors. Researchers are working to learn how to precisely control the properties of carbon nanotubes so that they can be used as both the semiconductor and metal components of transistors. "Generally, carbon is not a metal, but carbon nanotubes with a particular configuration are," Stach said. Semiconductors, such as silicon, sometimes behave as conductors and sometimes as insulators, whereas metals always behave as conductors. Researchers have known for several years that carbon nanotubes randomly form so that they are sometimes metallic and sometimes semiconductor, but until now they have not known the precise reasons why. Carbon nanotubes can be visualized as sheets of carbon atoms one layer thick and rolled up into tubes. Much like the pitch of a screw, they can have a different configuration depending on how they roll up, and this configuration determines whether they conduct like a metal or a semiconductor. The nanotubes are "grown" in a vacuum chamber by exposing iron particles to methane gas. The gas contains carbon and hydrogen, and the iron particles act as a catalyst to liberate carbon from the gas. The particles are heated to about 800 degrees Celsius, or more than 1,400 degrees Fahrenheit. With increasing exposure, the iron eventually contains too much carbon and becomes "supersaturated." As a result, the carbon precipitates as a solid, causing the nanotube to begin forming. 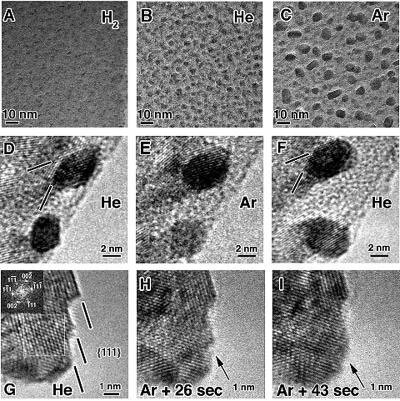 Honda researchers learned recently that they could control whether the carbon nanotubes become metal or semiconductor by using either argon or helium as "carrier gases" to aid in flowing the methane into the chamber in the presence of water. Researchers at Louisville used the technique to produce large quantities of nanotubes and made careful electrical measurements to confirm whether the nanotubes were metallic or semiconductor. Purdue researchers took high-resolution images using an instrument called a transmission electron microscope to determine why the process works. "The instrument enables you to take images while the nanotubes are forming," Stach said. "We can see the atomic structure of the materials while also looking at how the environment affects them." The Purdue portion of the research is based at the Birck Nanotechnology Center in the university's Discovery Park. "These findings provide a window into the intimate relationship between the atomic structure of the catalyst nanoparticle and the carbon nanotube that grows from that catalyst nanoparticle," said Timothy D. Sands, the Mary Jo and Robert L. Kirk Director of the Birck Nanotechnology Center. "The results also show that the atomic structure of the catalyst nanoparticle can be controlled by the ambient carrier gas, a linkage that may represent the first step toward a solution to one of the most vexing challenges in nanotechnology." The Purdue researchers learned that if helium is used instead of argon, the iron particles have a specific size and shape and also have pronounced facets, but the facets diminish and the particle size varies when argon is used. "The facets form nearly at right angles, but when you switch from helium to argon those facets round out," Stach said. "The helium and the presence of these strong facets, together with the size of the iron particles, appears to be what allows the creation of the metallic nanotubes. "Our results indicate that you might be able to control the size and shape of the catalyst sufficiently to control the structure and thus the conductivity of the nanotubes. It is the first demonstration of a deterministic relationship between the catalyst state and the resulting nanotube structure." Researchers aren't sure what role the water plays in the process. "The water might promote the formation of the facets, and the argon might somehow prevent the water from doing so, but more research is needed to determine this," Stach said.